Report: Obama's Big Money Raisers Get Key Posts, Access, Stimulus Dollars : It's All Politics When a president vowed as a candidate to break money's raptor grip on Washington then, once in office, continued some of the very same practices in which big donors are apparently rewarded, then some voters may smell hypocrisy. U.S. 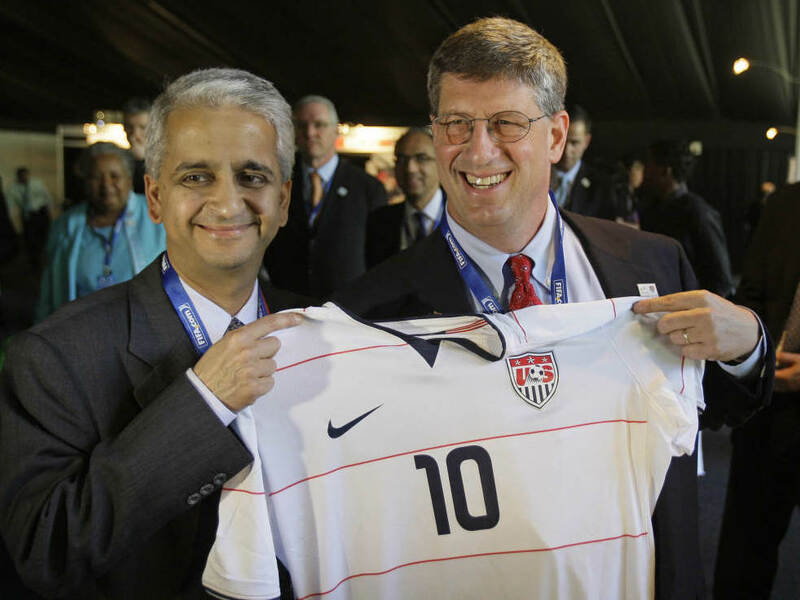 Ambassador to South Africa Donald Gips, right, with U.S. Soccer Federation president Sunil K.Gulati in Cape Town, December 2009. Gips was a big Obama bundler. It would be hard if not difficult to find a president who hasn't favored his biggest campaign donors with access to him or other top officials, administration jobs or other perks. But when a president vowed as a candidate to break money's raptor grip on Washington, then once in office continued some of the very same practices in which big donors are apparently rewarded, then some voters may smell hypocrisy. A new iWatch News investigative report from the Center for Public Integrity could fuel such voter sentiment toward President Obama. The iWatch reporters found that Obama's money-raising heavy hitters, the wealthy "bundlers" who raised donations for the president's campaign from other rich people haven't been forgotten by the administration. They've gotten prestigious positions in the administration or access to the president or other senior aides. In some instances, their companies received economic stimulus money or could benefit from administration policy stances. • Overall, 184 of 556, or about one-third, of Obama bundlers or their spouses joined the administration in some role. But the percentages are much higher for the big-dollar bundlers. Nearly 80 percent of those who collected more than $500,000 for Obama took "key administration posts," as defined by the White House. More than half the ambassador nominees who were bundlers raised more than half a million. • The big bundlers had broad access to the White House for meetings with top administration officials and glitzy social events. In all, campaign bundlers and their family members account for more than 3,000 White House meetings and visits. Half of them raised $200,000 or more. • Some Obama bundlers have ties to companies that stand to gain financially from the president's policy agenda, particularly in clean energy and telecommunications, and some already have done so. Level 3 Communications, for instance, snared $13.8 million in stimulus money. At least 18 other bundlers have ties to businesses poised to profit from government spending to promote clean energy, telecommunications and other key administration priorities. It raises questions: Did Obama really believe he would change Washington's ancient deference to cash when he left the impression during the 2008 campaign that money wouldn't buy influence in his administration? Or was he more cynical, deliberately telling voters what he knew they wanted to hear even as he knew that he would play the game the way it's always been played, rewarding big contributors disproportionately to other supporters? Either possibility doesn't exactly portray him in the best light. While the Obama administration tightened restrictions on hiring lobbyists, the deference it has shown major donors contradicts its claims to have changed business as usual in Washington, critics said. Others said Obama strains credulity in claiming to bring reform to Washington while carrying on the patronage practices of past administrations. They added that many big donors aren't shy about asking for specific favors, which gives candidates of both parties little choice but to keep patronage alive. "Any president who says he's going to change this is either hopelessly naïve or polishing the reality to promise something other than can be delivered," said Paul Light , a New York University professor and expert on presidential transitions. "At best it's naïve and a little bit of a shell game." In an odd way, Obama's practices on this front may be one of the strongest counterarguments to those who have accused him of being "the other," of not being "American" enough, whatever that means. In this respect, he may not physically resemble other presidents. But he certainly acts like them. Public Citizen in 2008 found that George W. Bush had appointed about 200 bundlers to administration posts over his eight years in office. That is roughly the same number Obama has appointed in little more than two years, the iWatch News analysis showed.